Asha Vihar lies in the savanna of Jharkhand and means “place of hope”. Asha Vihar is a development aid project with a hospital, where people are treated with conventional medicine, acupuncture, homeopathy, ayurveda and physiotherapy. Asha Vihar also includes the Children’s Village, an orphanage that currently houses 34 children and adolescents. Another centerpiece of Asha Vihar is its support in the villages. In order to improve the health situation of the people in the most remote regions, there are small outposts of Asha Vihar, the so-called Satellite Stations. In addition, Asha Vihar regularly conducts humanitarian and educational projects in the surrounding villages. Finally, there is a surgical camp, in which children with severe deformations of the feet and legs, such as Club feet, can be treated. Asha Vihar, founded in 1995 as a small acupuncture clinic has since become a well-known point of action to which people travel – even from the surrounding states. We are proud that Asha Vihar is recognized by the WHO as a training center for acupuncture. 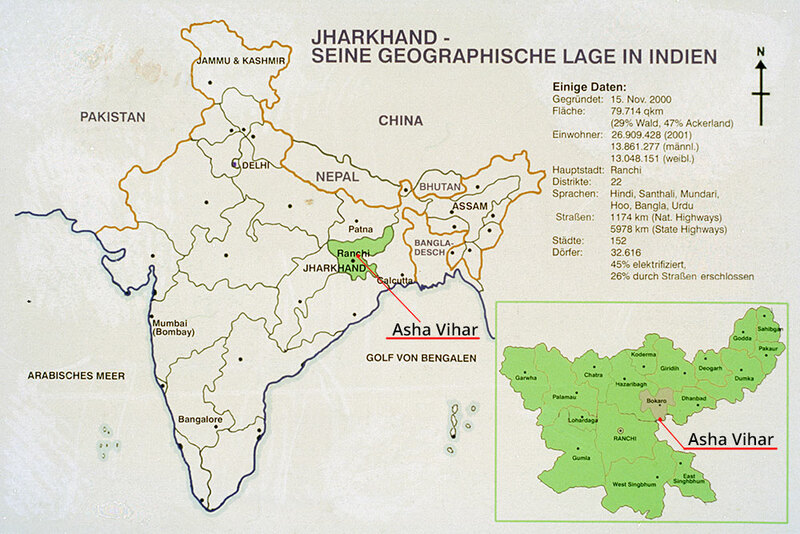 Asha Vihar is the project of Johar Gesellschaft Deutschland. Information about the structure of the Johar Society can be found here. Hospital, Children’s Village, Humanitarian Aid, Education and Health Projects: The Asha Vihar project is complex and diverse. We not only help people medically but also confirm their harmony with their surroundings, their circumstances and needs. It is part of our guiding idea to be self-sufficient. This includes providing ourselves with essential resources such as water and energy. (It opens a window with a map of Asha Vihar. If you move the mouse over the plan, the mouse pointer changes at the places where the plan is illustrated by pictures. Clicking with the left mouse button displays an image of the respective location.). Your support, be it a time - or a money donation, enables the project Asha Vihar. If you have questions or suggestions, you can use the adjoining contact form or contact us via the contact page.